Two slender straps sweep diagonally up the front of an elegant shimmery sandal lifted by a daringly high stiletto and a low tapered platform. 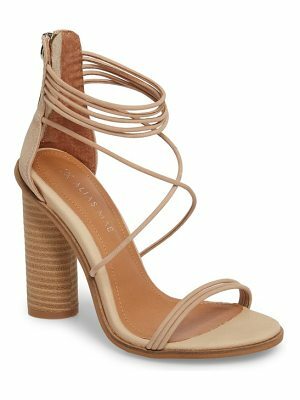 Style Name: Jewel Badgley Mischka Humble Strappy Sandal (Women). Style Number: 5331094. Available in stores.